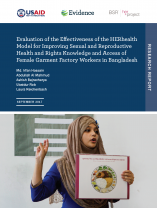 A new evaluation of Business for Social Responsibility (BSR)’s HERhealth model, conducted by the Evidence Project/Population Council, offers important evidence and recommendations for effective programming to improve the health of women workers in garment factories in Bangladesh and elsewhere. Bangladesh’s ready-made garment sector – an important contributor to the global garment industry and to Bangladesh’s economy – employs a predominantly female workforce, and has had a major impact on women’s autonomy and economic empowerment. Alongside potential financial benefits, however, female factory workers face a myriad of health issues, many of which aren’t adequately addressed by traditional workplace health programs. BSR’s HERhealth model, one pillar of BSR’s HERproject, seeks to improve the health-related knowledge, behaviors and access of low income working women through strengthening factory clinics, engaging factory management in the issue of workerhealth, and training peer health educators. The HERhealth intervention had a positive impact on knowledge and behavior related to menstrual hygiene, in part because of the intervention’s facilitation of relationships between factories and menstrual products suppliers, which made it possible for factories to offer reduced-cost sanitary pads to workers. A positive impact was also observed on workers’ knowledge of STIs and HIV/AIDS, knowledge of recommended antenatal care, and use of contraception. Factory managers reported observing positive effects on workers’ health-related knowledge, awareness, and behaviors, particularly related to hygiene and nutrition. Factory managers were generally supportive of the intervention and seemed to understand the value of healthy workers for improving business outcomes. Results show that family planning products like oral pill, condom, injectable, and IUDs were not provided by participating factory clinics, highlighting an important area for future investment and revision in the HERhealth intervention. Extend training content and duration: Many of the female factory workers who were exposed to the HERhealth program recommended more training on health-related issues. Engage male workers: Factory managers suggested that sensitizing male workers could support positive changes in their spouse’s knowledge and behavior. Regular follow up: Particularly in the context of high turnover in this sector, regular follow up by the implementing agency with factories where the HERhealth intervention has been completed is important to ensure positive impacts are sustained.